Our HES PV Grid-Tie systems can save (and make!) you money. Already in 2017 we are seeing a massive increase in the number of solar implementations. With an increased focus on climate chang e, increased cost of fossil fuels, and increasing price of electricity, home owners and businesses alike are deploying solar panels to their roofs in order to reduce their power bills and save electricity. Roooham Electric is proud to offer Grid-Tie systems designed by HES PV. With a Grid Tie system, home owners have even more benefits. Instead of being lost, excess energy collected by your Grid-Tie system can be fed back into the electrical grid. You receive a credit from BC Hydro for energy that is fed back. How does a Grid-Tie System work? Solar array: One to ten kilowatts of solar panels, typically mounted on unused south facing roof space. 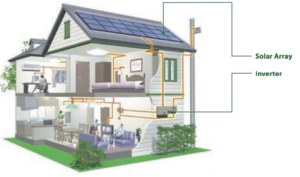 Inverter: Converts solar energy (DC) to match utility power. Grid-tie systems safely disconnect in the event of a power failure. We offer the option of a Secure Source battery backup that would run some selected loads like pumps or lighting in the event of a blackout. 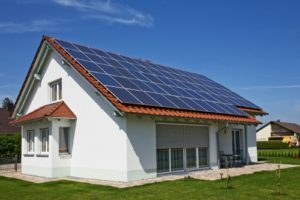 How much energy can I gather with a solar electric system? In most of Canada, a kilowatt (1000 watts) of solar panels (area A. of 80 – 90 ft2), mounted with good exposure facing south, could generate between 1000 and 1400 kilowatt hours (kWh) of electricity per year.